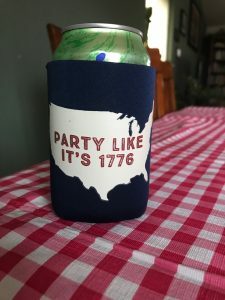 Last month we had some out of town visitors and while w were chatting one evening, I was sipping from a can of LaCroix I’d nestled into my favorite coozie. It’s a great conversation starter. So we were chatting about my love of all things Declaration of Independence, particularly the Founding Fathers. My guest asked if I’ve seen or listened to Hamilton the musical. I have not. 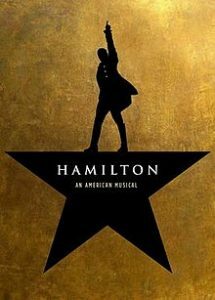 “You can’t say you like the Founding Fathers if you don’t like Hamilton,” was the reply, something along those lines. “Well I liked the founding fathers before it was cool,” I barked back. Was it ever uncool? Is it actually cool now? I’m still not really sure. I’ve heard that musical is amazing and I’m sure I’ll experience it someday. For now, I prefer the old Drunk History episodes featuring Jack Black as Ben Franklin. For as much as I cherish Philadelphia and all the history it holds, I haven’t done much reading on the subject. I own a lot of books on the subject, I just haven’t gotten to them yet. 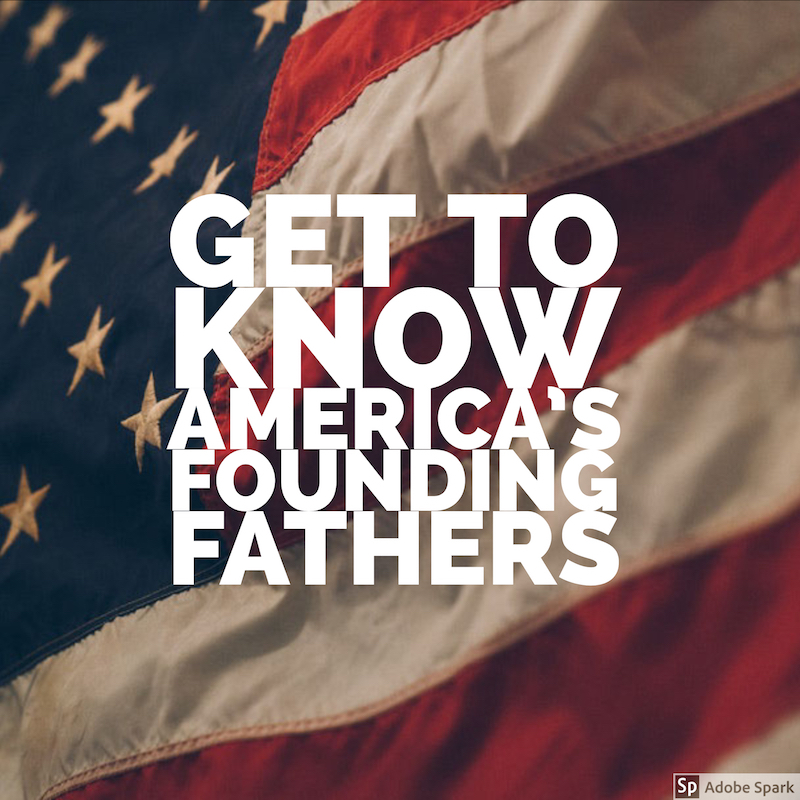 In 1973, historian Richard B. Morris identified the key Founding Fathers as these seven men: John Adams, Benjamin Franklin, Alexander Hamilton, John Jay, Thomas Jefferson, James Madison, and George Washington. 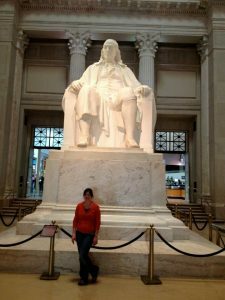 So here are some books that can get us all up to speed on all of our Founding Fathers, not just our favorites! 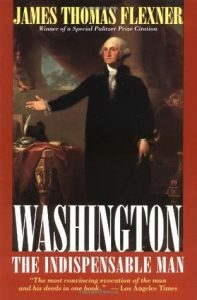 From Goodreads: After more than two decades, this dramatic and concise single-volume distillation of James Thomas Flexner’s definitive four-volume biography “George Washington,” which received a Pulitzer Prize citation and a National Book Award for the fourth volume, has itself become an American classic. Now in a new trade paperback edition, this masterful work explores the Father of Our Country – sometimes an unpopular hero, a man of great contradictions, but always a towering historical figure, who remains, as Flexner writes in these pages, “a fallible human being made of flesh and blood and spirit – not a statue of marble and wood… a great and good man.” The author unflinchingly paints a portrait of Washington: slave owner, brave leader, man of passion, reluctant politician, and fierce general. His complex character and career are neither glorified nor vilified here; rather, Flexner sets up a brilliant counterpoint between Washington’s public and private lives and gives us a challenging look at the man who has become as much a national symbol as the American flag. 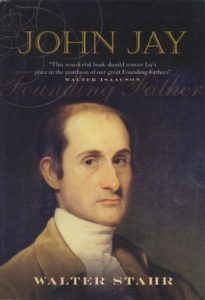 From Goodreads: John Jay was one of America’s greatest Founding Fathers. Drawing on substantial new material, Walter Stahr has written a full and highly readable portrait of both the public and the private man. 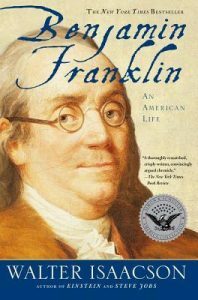 From Goodreads: In this colorful and intimate narrative, Isaacson provides the full sweep of Franklin’s amazing life, from his days as a runaway printer to his triumphs as a statesman, scientist, and Founding Father. He chronicles Franklin’s tumultuous relationship with his illegitimate son and grandson, his practical marriage, and his flirtations with the ladies of Paris. He also shows how Franklin helped to create the American character and why he has a particular resonance in the twenty-first century. 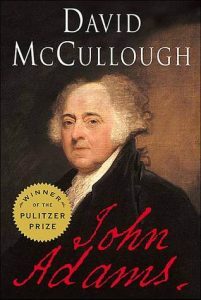 From Goodreads: In this powerful, epic biography, David McCullough unfolds the adventurous life-journey of John Adams, the brilliant, fiercely independent, often irascible, always honest Yankee patriot — “the colossus of independence,” as Thomas Jefferson called him — who spared nothing in his zeal for the American Revolution; who rose to become the second President of the United States and saved the country from blundering into an unnecessary war; who was learned beyond all but a few and regarded by some as “out of his senses”; and whose marriage to the wise and valiant Abigail Adams is one of the moving love stories in American history. 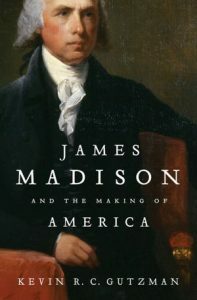 From Goodreads: Instead of an idealized portrait of Madison, Gutzman treats readers to the flesh-and-blood story of a man who often performed his founding deeds in spite of himself: Madison’s fame rests on his participation in the writing of The Federalist Papers and his role in drafting the Bill of Rights and Constitution. Today, his contribution to those documents is largely misunderstood. He thought that the Bill of Rights was unnecessary and insisted that it not be included in the Constitution, a document he found entirely inadequate and predicted would soon fail. Madison helped to create the first American political party, the first party to call itself Republican, but only after he had argued that political parties, in general, were harmful. From Goodreads: The definitive life of Jefferson in one volume, this biography relates Jefferson’s private life and thought to his prominent public position and reveals the rich complexity of his development. 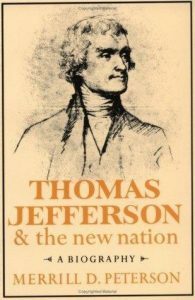 As Peterson explores the dominant themes guiding Jefferson’s career–democracy, nationality, and enlightenment–and Jefferson’s powerful role in shaping America, he simultaneously tells the story of nation coming into being. 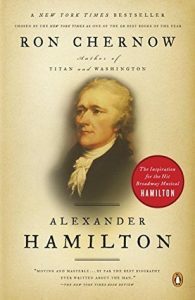 From Goodreads: A fresh look at the critical role of women in the lives of Washington, Franklin, Adams, Jefferson, Hamilton, and Madison. 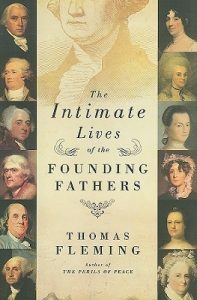 Fleming nimbly takes readers through a great deal of early American history, as our founding fathers struggle to reconcile the private and public–and often deal with a media every bit as gossip-seeking and inflammatory as ours today. I’m not a history buff but think it would be really interesting to read about the lives of the signers of the Declaration of Independence. It is critical to study these folks0 and their intreactions- to discern the true thought that went into the development of this great republic.